I love puzzles and games. 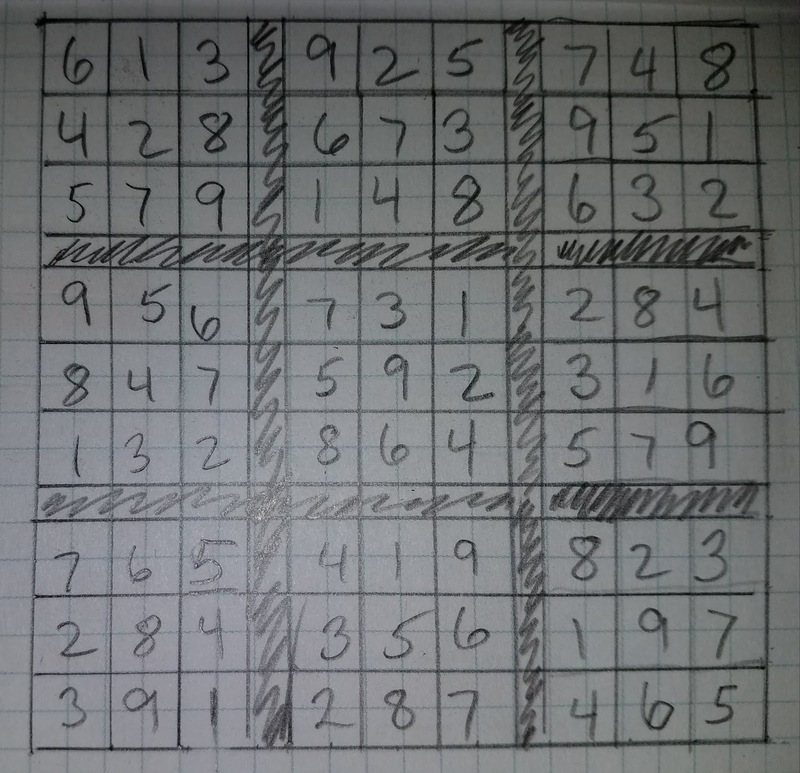 Sudoku puzzles are among my favorite. It's my go-to when I'm out with the dog waiting for her to ... you know ... do her dog thing. If you aren't familiar with the game, you can google the rules. Maybe you'll become a puzzle nerd like me. Here are the basics: 9 rows and 9 columns of numbers 1 - 9. Each row and column must contain each of the nine numbers with no repeats. Furthermore, each of nine 3x3 grids must also contain each of the nine numbers. The puzzle starts with a few of the numbers in place to serve as clues. There are billions of possible variations. Spoiler alert! I've solved the puzzle for you this time. Your challenge is to keep the squares in order. 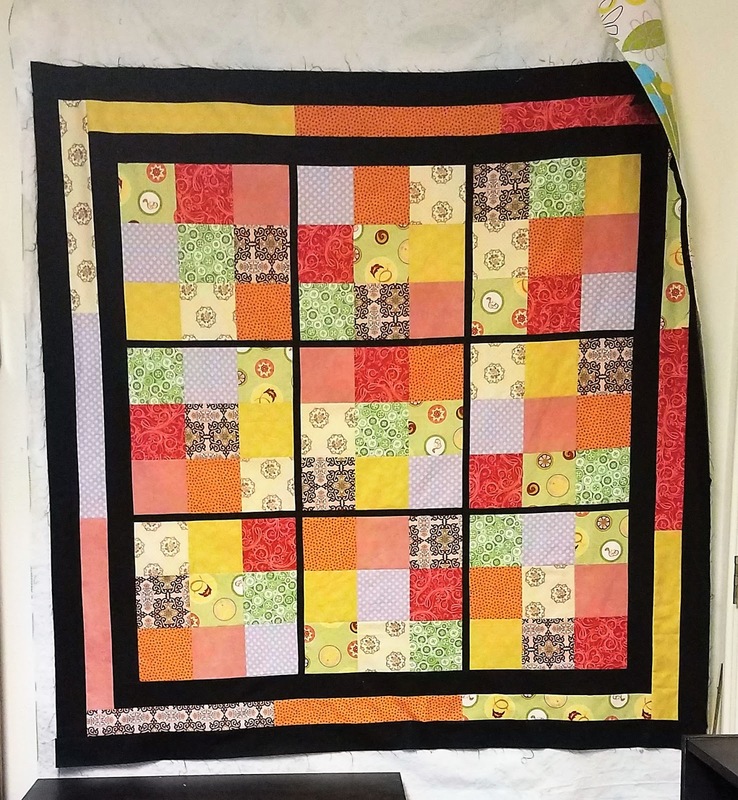 The Sassy Sudoku quilt is traditionally pieced. I thought it unfair to start with a Seamless Piecing quilt, as there will be a learning curve. (Another challenge for another day.) 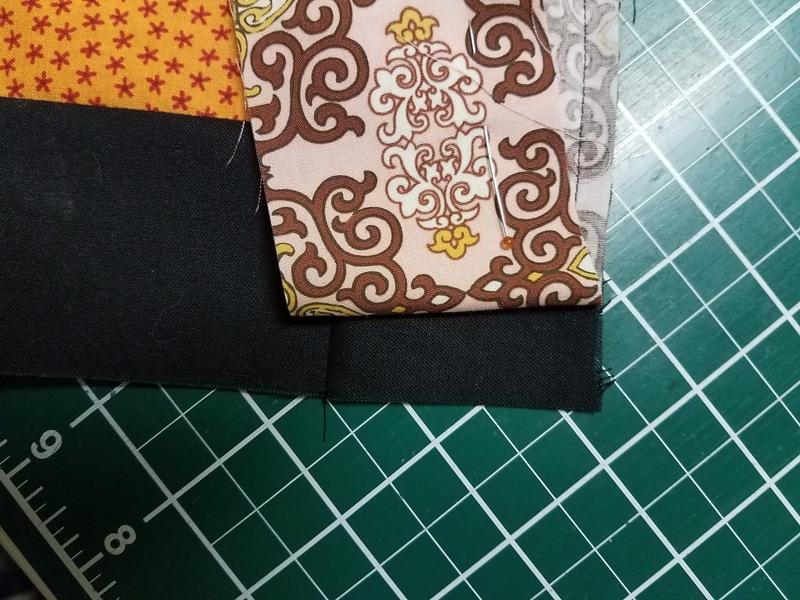 This quilt is easy enough for a beginner, and I've thrown in a partial seam as a skill builder, just for fun. I've tried to indicate what the expected measurements should be at the end of each step. 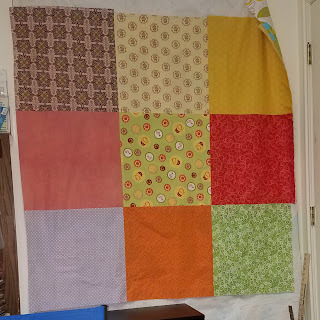 As always, particularly with borders, measure your quilt and use those measurements. Note however, if you are very close to the suggested measure, like within a quarter inch, try to work it in. 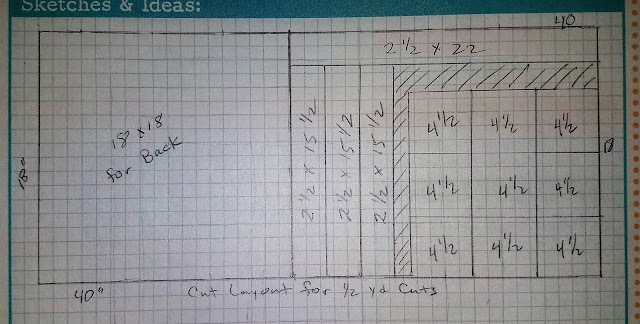 If your measure is very different than mine, you may want to check your work and refine your 1/4" seam. Selvage - edges used in manufacturing fabric. Must be removed. 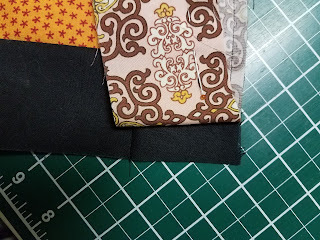 Nested Seams - Seam allowances pressed in alternating directions so they don't lay on top of each other, this creates a flat seam as well as nice corners and points. Finished measure approx, 50 1/2" square. 1 yard solid Black for background. 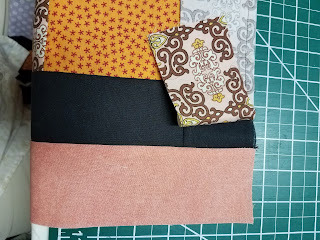 You'll need an additional 1/4 yard if you want your binding to match the background, as I decided to do in the end. 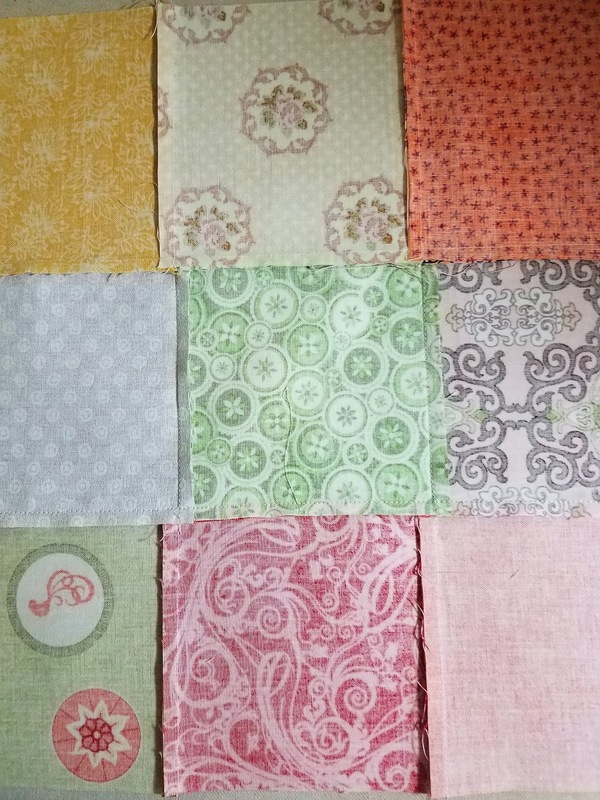 9 - 1/2 yard cuts* with distinct colors or patterns. 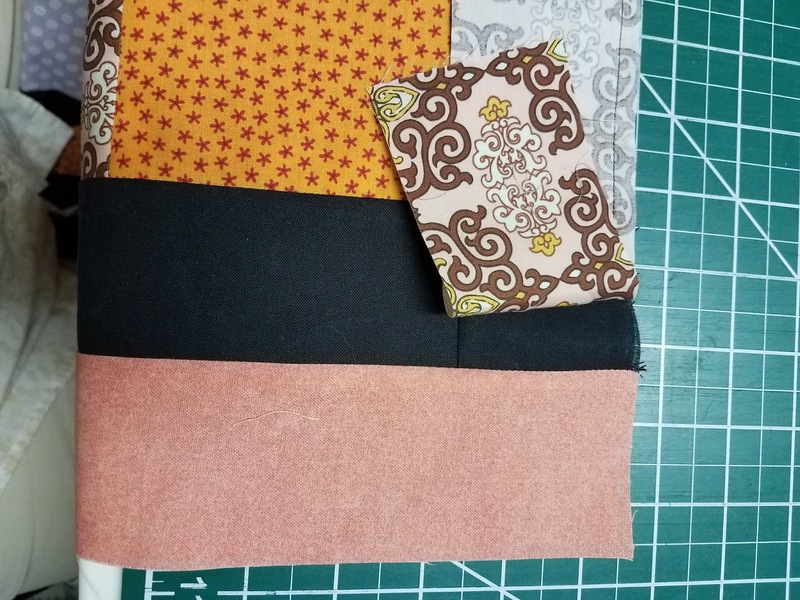 This fabric will include what we need for piecing the top as well as the 9-patch back and binding. *Don't let your quilt store short you on these cuts. You'll need all 18" after squaring up. DO NOT FOLD YOUR FABRIC IN HALF FOR CUTTING. The cuts are not symmetrical. There is very little margin for error, so measure twice, cut once! When piecing quilt backs, use 1/2" seam allowances to piece and press the seams open. It will make it easier to quilt. Cut an 18" square for the backing by removing the selvage from ONE end of the fabric. Then measure and cut 18" from that end. Square the sides for an 18" square. Do this for each of the 9 fabrics. I apologize for my falling design wall. Anybody have a thumbtack? 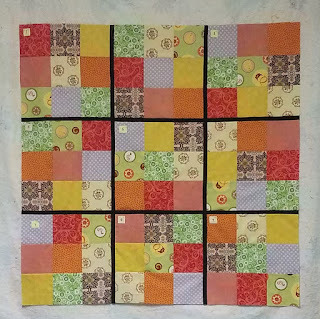 Arrange the squares into a 9-patch arrangement that you like and sew as you would any 9-patch: first in 3 rows of 3, then the three rows together. Because the seams are pressed open, take care that your seams line up correctly. The back should measure 52" square. 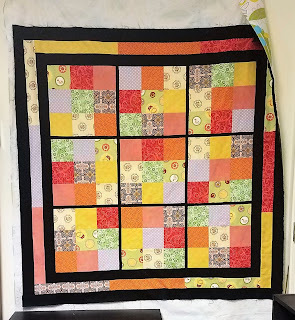 If you plan to quilt this on a long arm, you'll need to make the back larger by adding a temporary border around the backing. For now put your sewn back somewhere you can refer to it often. Mine is on my design wall. Yours may be a pic on your phone. 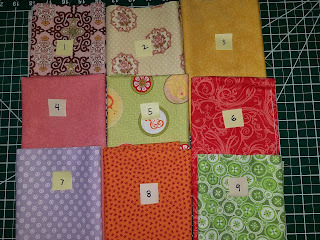 Number your fabrics 1-9 in the order they appear in the backing. After cutting the 18" square, square up the remaining fabric. After squaring, remove the selvage and trim the edges so they are all straight and even. *See note below. Cut one strip, 2 1/2" x remaining WOF" (about 22"). Turn the fabric and from the short end of the remaining rectangle cut three strips 2 1/2" x 15 1/2" and set aside. Then cut nine squares 4 1/2" x 4 1/2". This is what we're looking for from each of the nine fabrics. 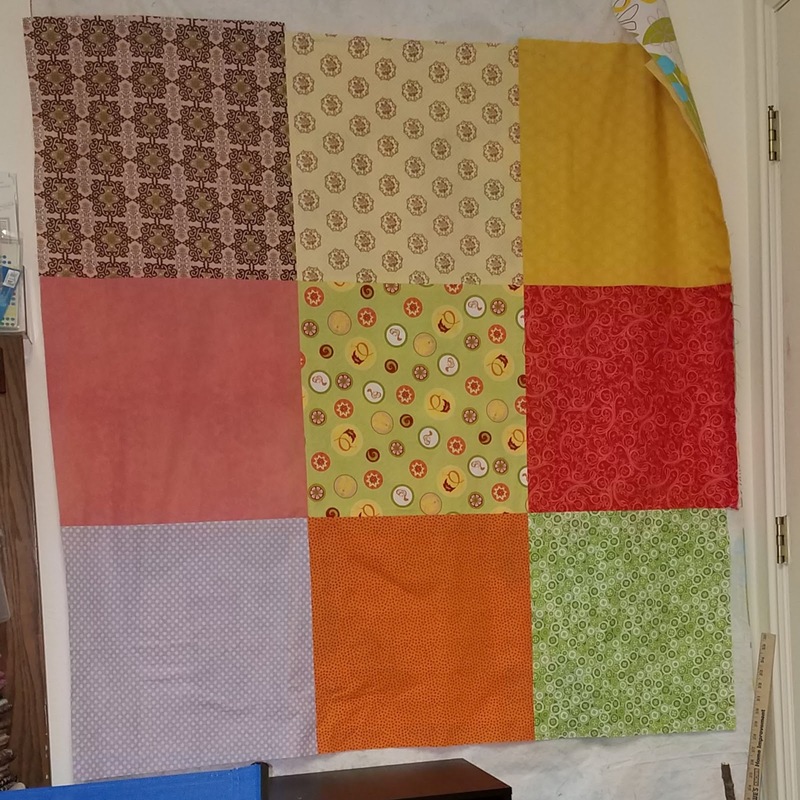 *Afterthought: After finishing the quilt top I realized I'd prefer the binding to be the same as the background. 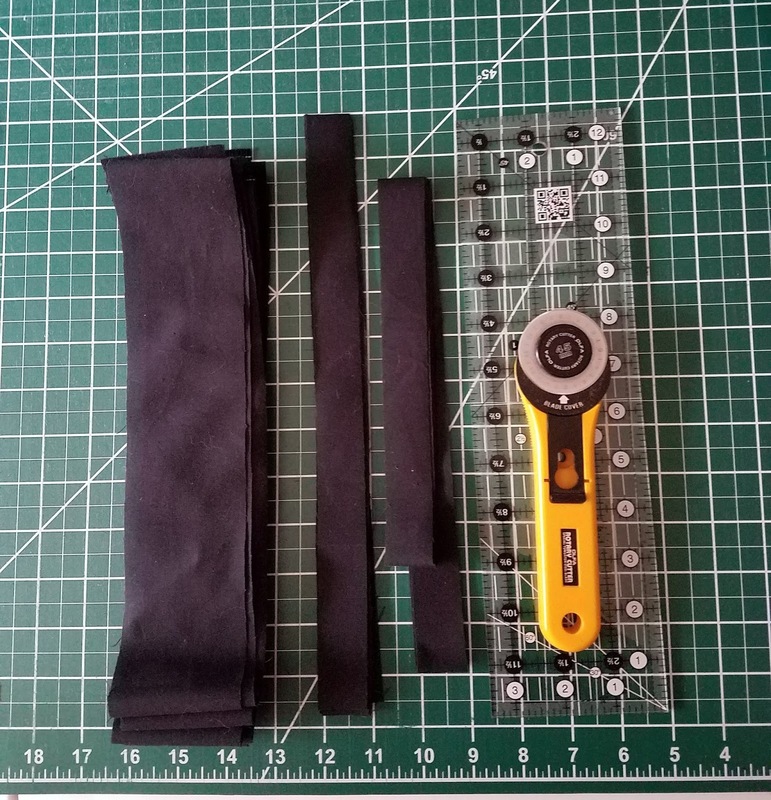 If you agree, you'll need to purchase more background fabric, as mentioned in the materials list, and you won't use the 2 1/2" x 22" strip and one of the 15 1/2" strips. Here's a cutting diagram for visual learners like me. Set the strips aside for now and make 9 piles of squares, each with one square of the 9 different fabrics. Each pile will become a 3x3 Sudoku grid. 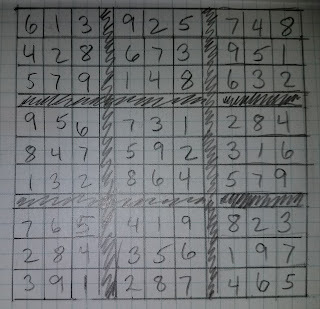 Using the squares from one pile, and referring to the numbered diagram below, arrange the fabrics into a 3x3 grid containing one square from each fabric, following the rules of Sudoku. Notice that the numbers on the fabrics correspond with the numbers in the upper left grid of the puzzle. You'll make 9 blocks. One corresponding to each of the grids in the puzzle. Sew three rows of three squares. Press the seams of the top and bottom rows to the left and the seams of the center rows to the right. Then add the top and bottom rows to the center row. Nest the seams for nice intersections. (Refer to the photo in the common terms section.) Press the block from the top, then turn it over to make sure the seams go in the direction you want. Repeat for all 9 piles of squares. 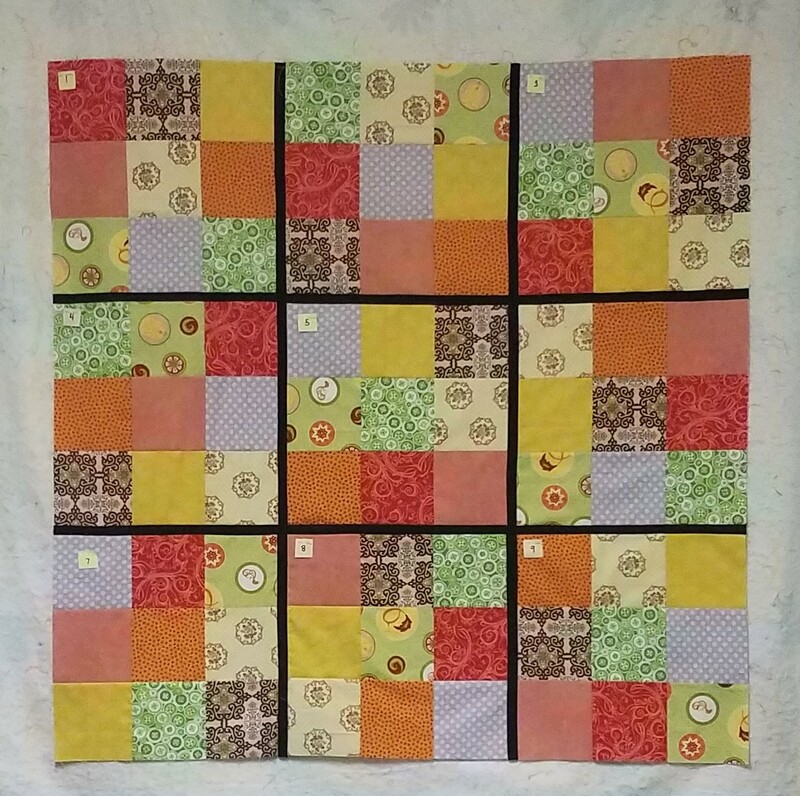 Each block should measure 12 1/2" square. 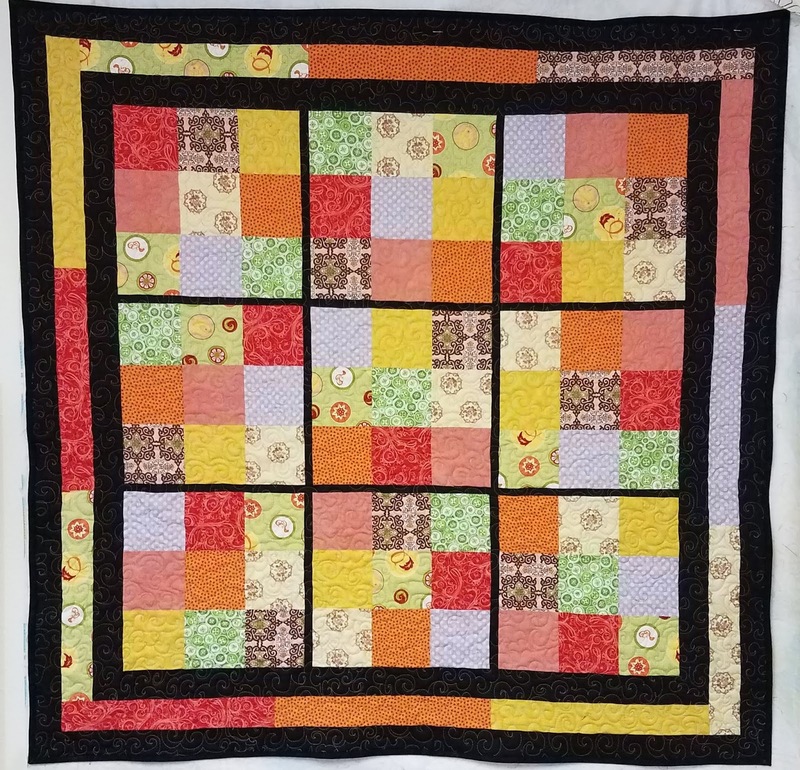 I recommend placing a pin in the top left corner of each 9-patch with a note identifying it's place and direction in the quilt. Block 1,2,3 etc. Starch, press and square the fabric. Cut four strips 1" x WOF. From two of the strips, subcut three 12 1/2" sashings for a total of six. From the other two strips, subcut long strips 37 1/2" each. Discard the 1" remnants. Cut nine background strips 2 1/2" wide. 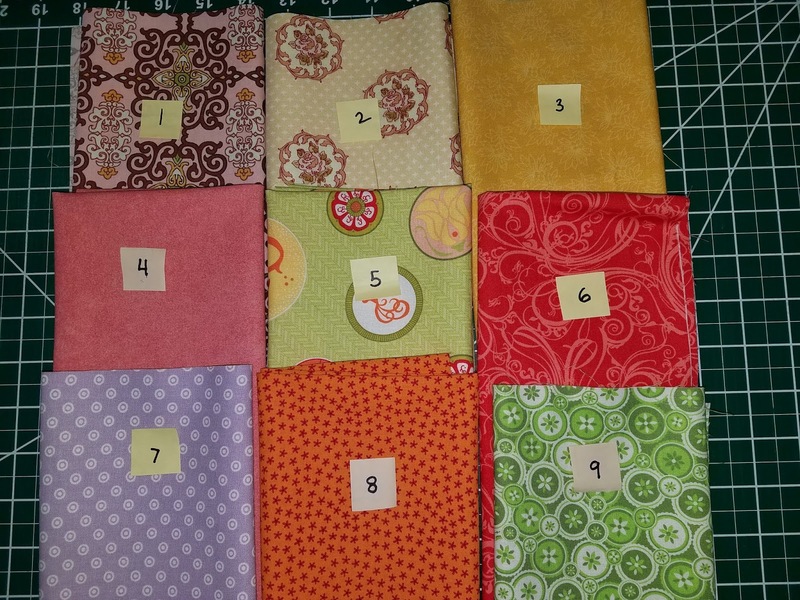 (15 if you plan to bind with your background fabric) Set aside 5 (+6 for binding) of the strips. 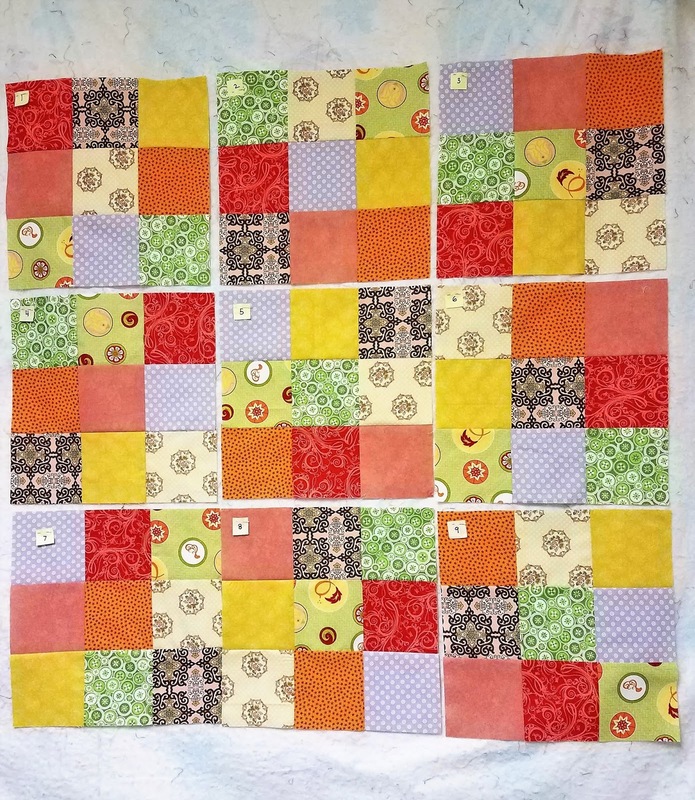 **With the remaining 4 strips, sew two sets of two strips together to create two long strips. Use a diagonal join and press the seams open. From each joined strip, cut a strip 37 1/2" long, then one 41 1/2" long. Arrange the cut so the joins are not on the ends of the strips. Set aside all the 2 1/2" wide strips and gather the 1" strips. Sew the 1" x 12 1/2" sashing pieces to the center block of each row, one on either side. Press toward the sashing. Add the left side blocks of each row, then the right side blocks of each row. Press toward the sashing. You should now have 3 rows of 3 blocks with sashings between. Each unit should measure 12 1/2" x 37 1/2". Sew the 1" x 37 1/2" sashings , one on top and one on bottom of the center row. Press toward the sashing. Align the sashings of the top and middle row. Pin if needed to maintain alignment while sewing. Sew the top row of blocks to the top sashing of the center unit. Press toward the sashing. Repeat for the bottom row. The piece should now measure 37 1/2" x 37 1/2". At this point it wouldn't hurt to give the whole quilt center a good press to make sure it's nice and flat. 2 1/2" x 41 1/2", one on the top and one on the bottom. Press to the sashings. The quilt should now measure 41 1/2" square. Easy peasy. We're going to use a partial seam here. Don't be scared, it will be fun, and it will leave a sassy little surprise in your quilt for anyone who looks at it closely. Ready? Choose one of the colored strips you just made. Choose a side to sew first. It doesn't matter which one, just so you sew the strip onto the left edge. Begin sewing at the top of the quilt and stop about 1" before you come to the bottom. The strip will be too long for the side and won't have anywhere to go, but don't feel sad for it. We'll give it a home soon. Press the sewn part of the seam allowance toward border 1 (black in the photo above). Turn the quilt 90 degrees to the right. Choose the next colored strip. 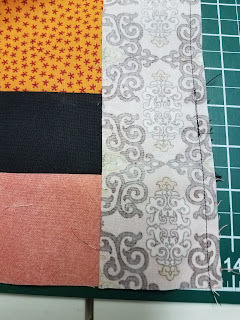 Sew this strip from the top edge of the first border to the bottom of the quilt, just like you would any other border. The seam will end evenly with the previously sewn border. Press to border 1. Turn the quilt again and repeat for the third side of the quilt. Choose the last strip for the fourth side. 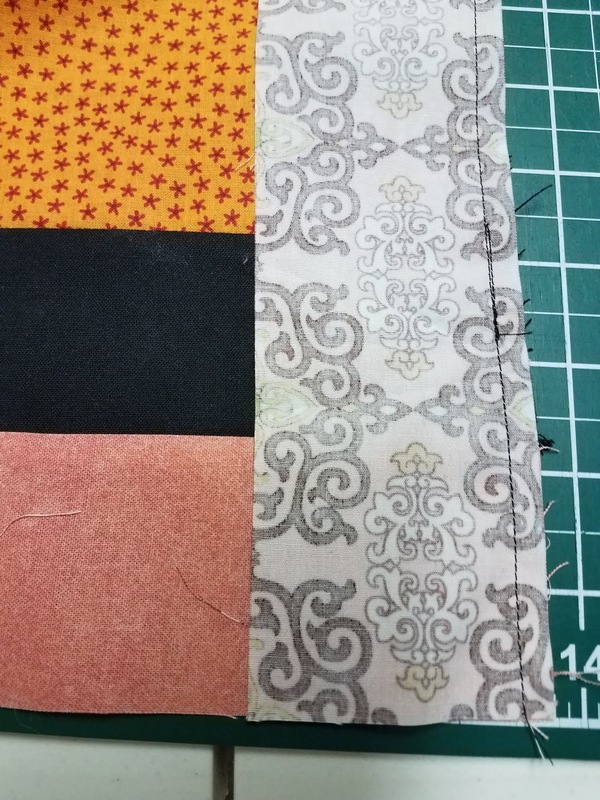 Align the strip at the top of border 1 and sew it on just like the other sides. Don't worry about that flapping end from the first side. If it bothers you just pin it out of the way. Press to border 1 and turn the quilt again to the first side. Now that the color strip (pink in the photo) is attached to the fourth side we can finish that partial seam on the first side. It will fit just like the others. Start sewing an inch or two behind where you ended the partial seam. Backstitch for security. Sew the flapping bit to its new home. 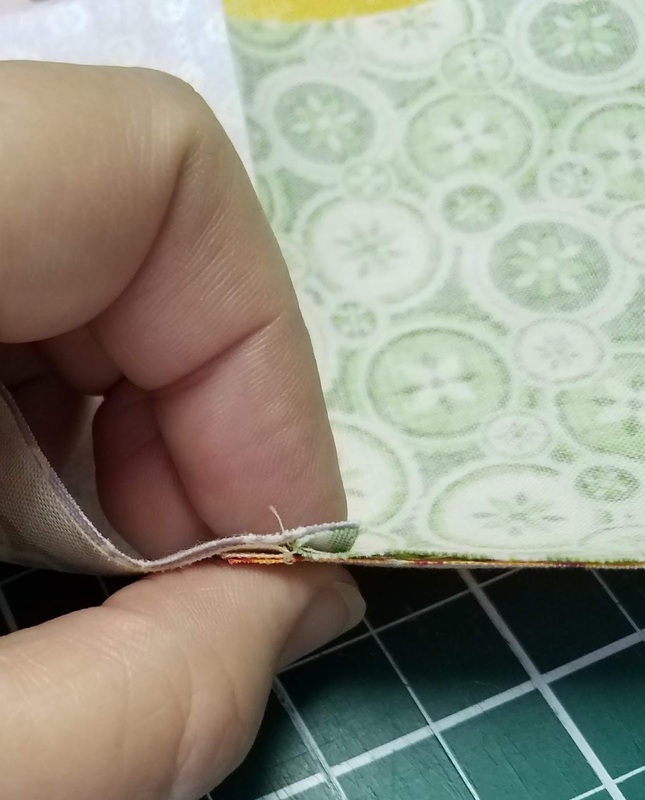 Press to border 1 and admire your beautiful partial seam. The quilt should measure 46" square. 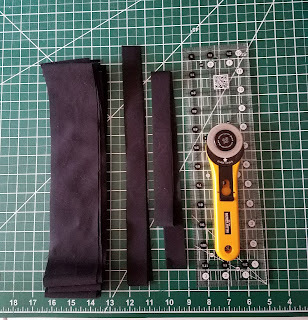 You'll need the remaining 2 1/2" black strips. (Not including the 6 needed for binding.) Sew them all together in one very long strip using diagonal joins. Press the seams open. (Remember to measure the actual size of your quilt and use those measurements.) Fold the long strip in half, right sides together. 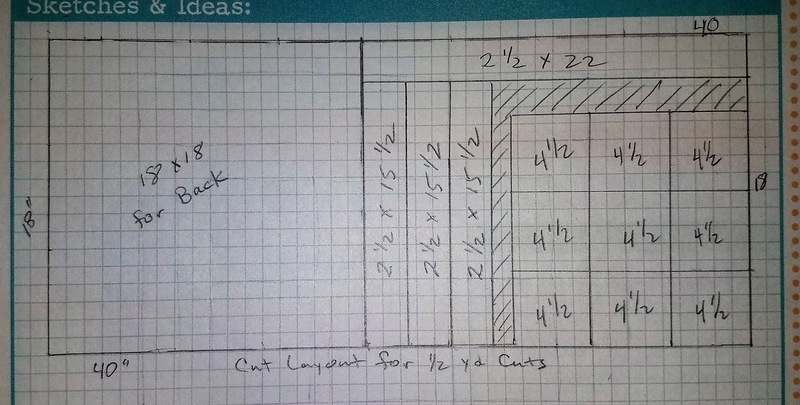 Measure and cut two strips 46" each. Measure and cut two more strips 50 1/2" each. Sew the 46" strips to the sides of the quilt. Press to the dark. Sew the 50 1/2" strips to the top and bottom of the quilt. Press to the dark. The top should measure 50 1/2" square. Hooray, the flimsy is finished! Aren't you glad we made the back first? It means we can get quilting on this right away! You can quilt it on your home machine with a walking foot or free motion. Stitching in the ditch around the 9-patches, then quilting something organic in the wider sashing would make the colors pop. Crosshatching would keep the theme. All over swirls or a simple meander would soften some of the "square-ness" of the design. Whatever you choose, have fun and make it yours with the quilting. To make the binding, sew together the remaining 2 1/2" strips of color fabric (or optional 6 strips of background) using diagonal joins. Again, choose the colors and lengths at random-ish. You don't want two pieces alike next to each other, but you also don't want a pattern to develop. Press the seams open. You'll need at least 220" of binding. There are tutorials all over the web about binding. Everyone has their favorite. This is mine. 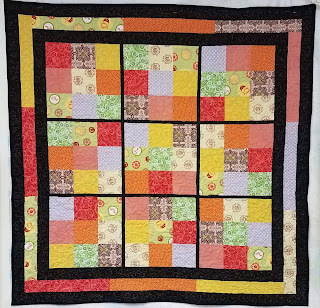 Enjoy snuggling with your awesome Sassy Sudoku quilt, or toss it over a table on game night! I hope you enjoyed making this game themed quilt with me. Watch for other game themed quilts in the future. Leave a comment and tell me about your favorite games. If you have any questions you can leave them in the comments or email me at RB.seamlesspiecing@gmail.com. See you next week! What a great start to your new blog. Thanks Veronica. I hope you love the Free Pattern! RB - I love puzzles, too. Sudoku, kakuro and kenken are my favorites! Congratulations. Thanks Bonny. I hope you enjoy the pattern.